Diecaster pleased that specifying a big working envelope no longer means settling for a slow machining centre. Largely as a result of receiving new medical and aerospace contracts, turnover has increased by 70 per cent in the last 12 months at MRT Castings, an aluminium diecasting company in Andover. Noteworthy is that the tonnage has scarcely changed. The increase in business is nearly all derived from machining the castings, which are becoming ever more complex, and from producing sub-assemblies. A user of Brother machining centres since the early 1990s, MRT has invested in six further machines in the last year and a half from UK agent, Whitehouse Machine Tools to cope with extra demand, bringing the total number of these Japanese-built, Diecaster pleased that specifying a big working envelope no longer means settling for a slow machining centre. 30-taper machines on site to 18. 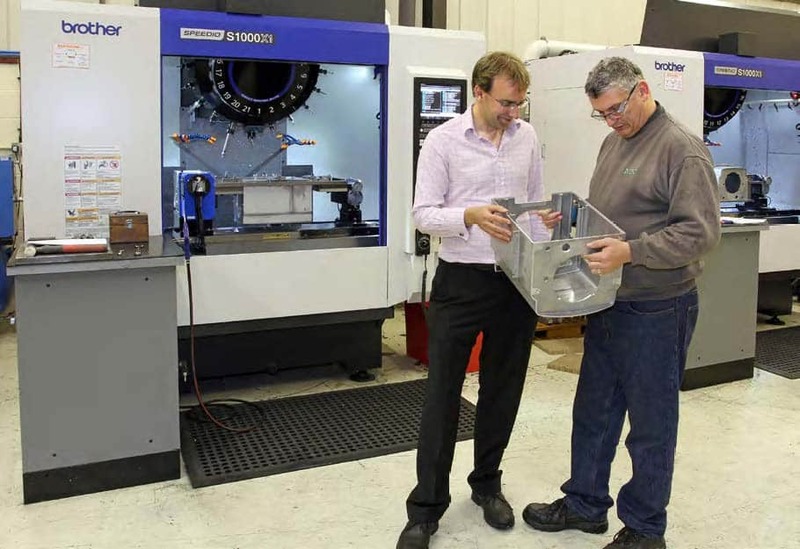 The latest two, designated S1000X1, are the first in the UK of a new model with a 1,000 mm X-axis. It is around one-third longer than that of the largest machine available from other 30-taper machining centre manufacturers, including Brother until now. Despite the 1,100 x 500 mm table, the machine’s footprint is compact at a nominal 2.4 metres square. Phil Rawnson, managing director of MRT commented, “Designers from Brother visited us in mid-2013 to ask what type of machine we would like them to develop next. Consulting with its customers is a good sign, as it means that the machine builder is listening to what the market wants. “As we are milling, drilling and tapping nearnet-shape aluminium castings in low to medium volumes and removing typically only a couple of millimetres of material, a 30-taper spindle is suitable for our needs. As a 30-taper machining centre with a one-metre X-axis stroke did not previously exist, Mr Rawnson bought 40-taper machining centres to process MRT’s larger castings. There were disadvantages, however. 40-taper machines are of unnecessarily high power for skimming off 2 mm of aluminium and are consequently overly power-hungry. They also tend to be more expensive to buy and the rapid traverses and spindle acc/ dec are slower, so cycle times are longer and productivity is lower. The S1000X1 design avoids these negatives by providing a highly productive machine with 50 m/min linear rapids (slightly higher in the 300 mm Z-axis). 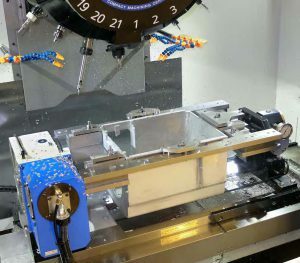 Tool change executed by the 21-station turret takes under one second, giving a chip-tochip time of 1.4 seconds, and is performed at the same time as X and Y axis movements and rotary table indexing to reduce idle time further. Rapid cutter exchange is an important aspect, as a large mix of tooling is needed to machine MRT’s castings. A new ISO control, CNC C00, provides faster processing, more functions and higher accuracy machining, especially in 3D. MRT’s existing programs for its 16,000 rpm Brother machines run 10 per cent faster on the S1000X1s without any modification, sometimes even faster depending on the type of cycle and the number of tool changes. If a program is transferred from an earlier 10,000 rpm spindle Brother machine fitted with the previous control to a 16,000 rpm S1000X1 with the CNC C00, average cycle time savings are even higher at around 30 per cent. When asked how he harnesses the extra working volume of the Brother S1000X1s , Mr Rawnson replied, “There are four ways we use the capacity. “First, we had a 150 mm column riser fitted to both machines so that we can swing a 550 mm part on a trunnion arrangement comprising a rotary table and tailstock. By using a bridge style fixture with pockets in the fixture plate, the fourth CNC axis allows machining to be completed on four faces of a casting in a single operation. “Secondly, if we need to hit the remaining faces of a component, we can carry out the secondary machining operation sequentially by fixturing parts side by side on a single fixture. “Thirdly, we are able to fixture a larger number of smaller parts to fill the table. By putting more castings under the spindle at the same time, fewer tool changes are needed per component and productivity is increased. Irrespective of how the machine is employed, speed is of the essence at the two machine shops on the Andover site. MRT uses four pressure diecasting cells, the fastest of which are capable of producing a casting every 40 seconds, and nearly all of them need to be machined in cycle times ranging from two to 20 minutes. To keep up with the metalcutting requirement over an extended day shift, the 18 Brother machines are of two configurations. Eleven have fixed tables, while the others are equipped with automatic twin-pallet changers utilising a total of 25 pallets set up with rotary trunnions and dedicated fixtures to speed changeover to the next batch. This occurs typically every one to two days per machine. The twin-pallet Brothers are generally used if cycles are short, say less than five minutes, to minimise spindle idle time during sequential op 1 and op 2 machining on six sides of a casting. Fixed table machines are more economical if cycles are longer, as one operator is able to load and unload a pair of machines to complete the two operations in tandem. To keep pace with production, trouble-free operation is as important as speed. Mr Rawnson affirms that there has been little downtime on the Brother machines over the years and their inherent reliability is reinforced by maintenance contracts and prompt service back-up from Whitehouse Machine Tools. Accuracies achieved are impressive, sometimes down to a couple of microns for bearing bores. Some electrical assemblies, for example, comprise up to 20 individual castings and tolerance build-up can become a problem if such tight limits are not held. Other work for the electronics, defence and top-end lighting sectors also stipulate tolerances that are sometimes very tight. Parts coming off the Brothers are not only dimensionally accurate but also highly repeatable, according to Mr Rawnson. 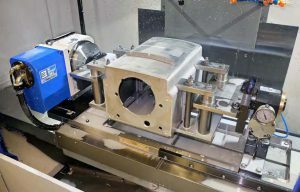 He concluded, “Whitehouse Machine Tools supplies every new machine as a as turnkey cell complete with tooling, through-spindle coolant, a fourth axis, mist extraction and tool and part probing. Programs, fixtures and tools are freely interchangeable between the machines, which gives us a lot of production flexibility.